Home/CIM Blog/Driving development from the market in or from technical expertise out? Connecting both smartly is the way forward! I just heard this sentence again during one of my latest interventions with a group of engineers, and I have heard it many times before. In their struggle for global competitivity and success companies have to innovate faster and faster and increasingly cater to the needs of customers in growth markets. 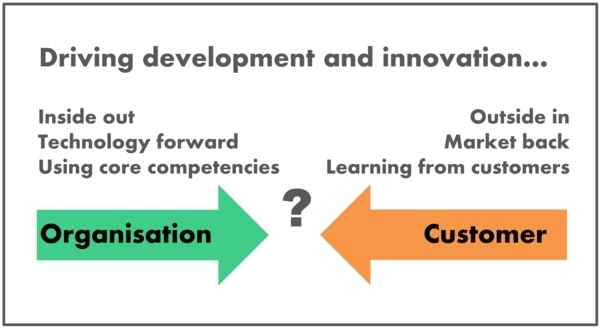 To find inspiration for such continuous, fast paced and well targeted innovation, companies attempt to become more market-centric, developing ways to learn from and with their customers. But the idea to drive product development from the market does not sit well with many developers. Their experience is that superior engineering, design, or research and development skills have led to their company’s best and most successful products. These skills represent core competencies of the company, are deeply ingrained in its culture and are a source of identity, pride and past and current success. To „learn from the customers“ meets with a lot of scepticism and resistance. It represents a change in perspective – developing from the outside in rather than from the inside out – and creates friction inside the organisation because it potentially threatens the importance and the standing that research and development or engineering has in the company. It feels foreign to many and seems to downgrade the importance of technical expertise. It is true that customers, lacking the technical knowledge and imagination of what might be possible, can mostly not articulate the features needed of a future product. In the early stages of mobile phones, who could have foreseen what modern smartphones do for us today? „Learning from customers“ means something else. It does not replace the great technical expertise of a sophisticated development department. My experience is that new inspiration grows from how a company connects and combines both, its superior development capabilities and the customers’ reality. Problem solution expertise needs to meet latent customer frustrations. These are often not readily at the surface and it is only by exploring, observing, experimenting together that customer constraints can be understood. Companies need to develop a mindset and build an infrastructure, the right structures, places and processes to bring this connection to life. They need to orchestrate opportunities for a free-flowing exchange between their sophisticated product development expertise on the one hand and their customer’s experience on the other. In this way new ideas can take shape. 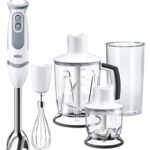 One of Braun’s successful products was a handblender like the one in this picture with chopping devices as accessories. Whilst the product was successful in many markets we could not seem to sell it in the Arabic world, which was part of my territory at the time. One day when with one of our distributors in the Middle East I met a cook who was quite famous throughout the Middle East, as he appeared regularly on Egyptian TV with a cooking show. He liked Braun products and used them on his shows, which was great advertising for us. But he did not use the handblender much. I tried to find out from him what typical Egyptian dish could be made with the help of this handblender, so that we could develop an advertising strategy around it. He could not really think of one. Then I got the idea to invite him to visit our central development unit at the German headoffice and spend half a day experimenting with the team there and teaching them about Arabic cooking. We asked him to bring along some typical ingredients which needed cutting or mincing in the Arabic cuisine to see whether it would work with our products. When he arrived, one of the things he brought with him was a bag full of Mulukhiyah, a plant that bears a ressemblance to spinach and is used to make „Mulukhiyah soup“, a dish so popular in Egypt that it is considered one of the country’s national dishes and its preparation is a cherished family tradition. As he started to explain and show our developers how and what he cooked and what he used our products for, the interest and enthusiasm in the experimental kitchen quickly mounted. Together they found that some of the Braun knifes where hard enough to cut and grind some very hard spices that otherwise could only be ground between huge, heavy and unpractical grinding stones. Finally they got to the Mulukhiya. Well, he said, it would be ideal if the chopper could mince the Mulukhiya into just the right consistency to make the soup, but he had tried it, it didn’t work. In fact, the consistency that came out was a rather disgusting kind of glue, definitely not fit to be turned into the famous soup. Our developers got hooked – with a big bag of Mulukhiyah to experiment, they tried all kinds of things and eventually found that, if they changed the angle of the knifes by just a fraction, the result was perfect. 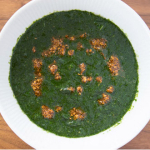 That allowed us to reposition our product in the Arabic world as a „Mulukhiyah Maker“ and sales took off.